Does the iPhone 8 have what it takes to be a success? Source: ¿El iPhone 8 tiene lo que se necesita para ser un éxito? Editor en Jefe, Forbes Digital (Mexico). How can we read the fact that the new iPhone lineup raised so little noise? There was no massive lines outside the Apple Stores and people demonstrated almost zero interest in the new models compared with the hype motivated by the iPhone 7. I don’t know about you but I don’t like waiting in lines. I don’t think Apple considers waiting in lines to be a good user experience for its customers. Over the years Apple has been able to improve availability and online orders so that lines can be eliminated. I suggest a better way to gauge interest in new models and that would be to look at sales. Sales seem to be going up even as lines have been going down. The iPhone 8. What do you think of the fact that the iPhone 7 is outselling the iPhone 8? Is it a fact? I think this notion is coming from a survey of operator stores in the US over a short time period. The mix of phones has never been known and is a matter of speculation. The only data we do have is the average selling price derived by dividing the revenues by the number of units sold (and ignoring deferrals). This price set a new record during the last 12 months. Expectations are that it will increase to another record again next year. I might add that this has never been observed in the phone business as far as I know. The opposite has been the trend. Whats the outlook for the the iPhone 8 vs the iPhone 7 and the iPhone X? The iPhone 8 is likely to be the best selling model over the next 12 months. The iPhone X will be the best seller in the first quarter but I expect it will come second during the following quarters. The iPhone 7 will end up 3rd. What do you think about the smartphone prices, aren’t they too high? How far can they be stretched ? Smartphone prices are very low. World-wide, average smartphones sell for less than $300. You can see a break-down by region here. iPhone prices are, on average, more than double the average of all smartphones. Note that apple’s latest line-up also includes the cheapest iPhone ever with the SE now starting at $350. I don’t think the average selling price will increase in 2018 globally. It will probably decrease as it has for a long time. Average iPhone prices will increase but probably only by $10 or so. More important however is that the iPhone remains priced at about $1/day, no matter the model, and as such the value users perceive is very high. The most expensive iPhone costs about 8 cents per hour of use, 1.4 cents each time you unlock it and 1 cent for ever 25 interactions you have with it (touches or taps). On a per use basis the iPhone is extraordinarily cheap. I know of no consumer product that is cheaper. This is determined partly by the intensity of use and by the high resale value (I assume 30% residual value after 2 years). Do we really need a borderless OLED display in a smartphone? What about the face recognition technology? Having no borders means you can get a screen that is bigger than the iPhone Plus in a phone the size of an iPhone. I think users will value getting more screen in a smaller phone. I certainly would. Having OLED means it can be curved a bit and also have nicer, truer black. Face recognition saves time and is more secure. I don’t know another way of making the experience better for something that you do 30,000 times a year. What do you think about the Apple Watch, which seems to be—finally—on the right track? The Apple Watch has been on the same track for 2.5 years. I don’t see any change in that trajectory. “Looks like we can reach 20,000 Model 3 cars per month in Dec”. Overall 2018 production guidance has been 500,000 units and 1,000,000 units in 2020. The company shipped 220 Model 3s in the July, August and September months. This is well below the expectation of 75,000 that the 2016 guidance would suggest1 or the 1,630 that might be suggested by the “production grows exponentially” July proclamation. I entered the Q3 production data and kept the previous run rate predictions for Q4 and 2018 and 2020 in the following graph. We know that Rolex produces about 1 million watches a year and we also know that Rolex had sales of $4.7 billion in 2016. The average revenue per watch1 was therefore about $4,700. My estimate has been that Apple sold about 15 million Watches in the last 12 months at an average price of about $330. This puts the Apple Watch revenue run rate at $4.9 billion, indeed above Rolex. They may be slightly high but the news makes me feel quite comfortable in my methodology. Note also that within the last quarter Apple said sales for the Watch increased by 50%. This is also reflected in my estimate of 3 million in Q2 vs. ~2 million for 2016 Q2. Overall, about 33 million Apple Watch units have been sold since launch and they generated about $12 billion in sales. Coupled with a 95% customer satisfaction score, altogether, this has been a great success story. But only 2.5 years in, it’s still act one. To understand the long term trajectory, it’s important to qualify this product as part of another, larger story. The Watch, even with LTE, is an accessory to the iPhone. It still cannot be activated without it. Even the coverage plan is an extension to an iPhone plan. The company is careful to address it as a companion product. At this point my prediction looks precarious. How much will the new iPhone cost? The answer, regardless of when you ask, is: The same as the current iPhone. Of course, this is the answer to the question of what will the average new iPhone cost. The average selling price (which combines the revenues and the volumes of all units sold and is reported every quarter) has not varied very much since early 2008. To the degree that there is variance (between $600 and $700) it is due mostly to seasonality and reflects a mix of more expensive units during the launch quarters and a cheaper units during later periods when the product is older and due for an update. 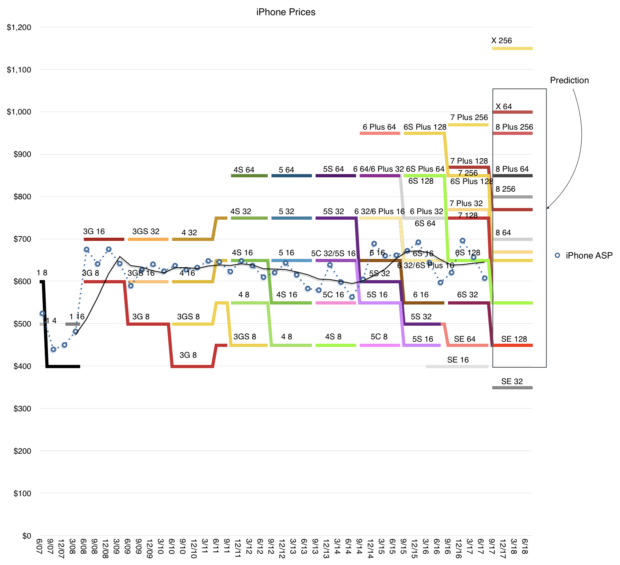 The original iPhone price changed due to a shift in subsidy model shortly after launch. An increase of $50 mid-2011 when the iPhone became available unlocked. Every three years a new, higher, price bracket is introduced, with a doubling of maximum memory capacity. The iPhone SE was introduced at a slightly lower price. The last year saw a slight increase in the highest price. The overall pattern looks like a staircase with a widening price range where the lowest price remains constant and the upper price rises every three years by $100. This iPhone staircase has been built over 10 years and I don’t see it changing over the next three. I therefore drew the blank box over what I thought would be the price range from now until late 2020. This is what I call the staircase model of Apple pricing. The staircase model must be understood in combination with the flat iPhone average price as the product matures. As the product matures the user base grows (to nearly 1 billion today). Later buyers will opt for the lower price points, but the availability of higher, more aspirational models (sustained by the brand) means that a minority will gravitate upward, mainly because they can. This ensures that although the median and mode of the price trend downward, the average price stays the same. The technique of preservation of average price seems to be in effect across Apple. 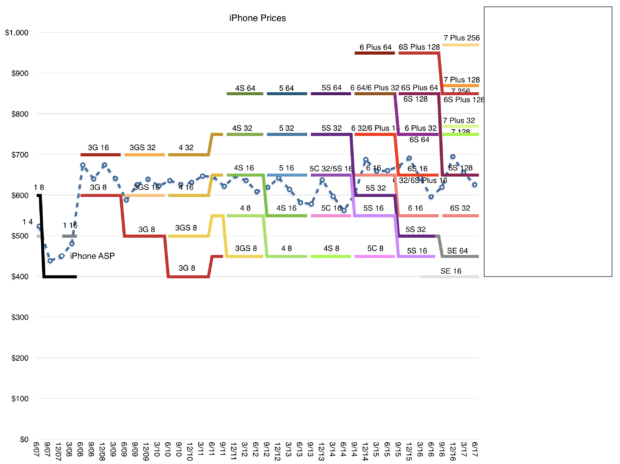 In other words, the evidence suggests that Apple prefers to keep average pricing for all products constant. Individual variants are priced so that, as the category matures, the changing mix leads to consistency in price ownership. Thus the iPhone can be seen as controlling the $650 point, the Mac $1200, the iPod $200 and the iPad $450. This pricing signals the product’s value and the value of the brand. The signaling is not just to buyers but also to competitors. Ownership of price forces competitors to occupy adjacent brackets. This process begins at launch: the new Apple product is introduced in what is perceived as a premium stratum2 thus the reaction from competitors is to “undercut” it. But, as Apple climbs the price staircase, preserving the floor, it keeps competitors bunched up at the bottom. Competing in the same brackets with Apple is futile as other brands can’t sustain the perceived premium position. The result is a remarkable consistency of average pricing which, coupled with a remarkable consistency of competitive positioning, coupled with a remarkable consistency of customer satisfaction and loyalty, leads to a remarkable predictability of cash flows and ability to invest in new product creation..
Apple is thus quite easily understood as a remarkably consistent consumer products business. The only surprise that remains is how long it takes for that understanding to propagate. The estimates (and guidance) suggest modest growth of 7% in revenues and 13.7% EPS. The predictability of the quarter suggests that attention will mostly be focused on guidance for the next quarter. Expectations can vary quite a bit because of the effects of a new launch. The product mix, pricing and timing are all unknown at this time. What is known however is that the customer base for Apple is increasing and loyalty is higher than ever. What I sense, coming from very few data points, is that there are more iPhones in use than ever before. A few years ago when the market was less saturated it was easy to assume that commodity Android phones and tablets would surge and swamp iPhone/iOS usage. This has not happened, indeed the data suggests that iOS usage is stronger than ever and that there are many more “switchers” moving from Android to iOS than vice-versa. This may surprise some but if we look at the PC market, a similar phenomenon has been taking place for years. Mac usage grows and Macs are more visible and valuable than PCs. It’s important to note that in the latter, post saturation stages, the markets for both phones and computers are increasingly driven by brand value. This resistance to commoditization is due to buyers’ perceptions of quality moving beyond utility and of the prioritization by buyers of new measures of performance. These new measures defy measurement. Much of what is therefore required of market analysts is intuition. From the way Apple reports its revenues you might think that the company has several operating segments. 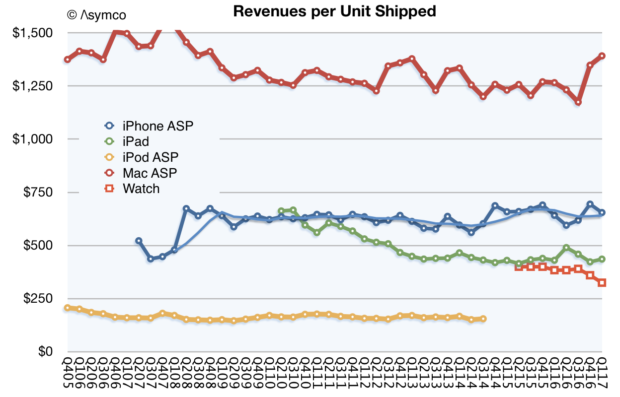 There are the iPhone, the Mac, the iPad for which units and revenues are reported. Then there are Services and Other Products for which we have revenues only. That leaves “Other Products” which now becomes the revenue segment that is “most likely to be ignored.” This segment had revenues of only about $11.5 billion in the last 12 months which would place it at only a Fortune 245 ranking, equivalent to a Toys “R” Us or Biogen. How should we value Other Products? Other includes many hardware products including iPod, Apple TV, Beats, Apple Watch, AirPods and, soon, HomePod. Each is a significant product, with Watch probably the largest single contributor. But since we don’t have specific unit numbers, we are left guessing at the contribution of each. This separation of Watch became harder to discern after the launch of AirPods. Though they are still very hard to obtain, they might be “moving the needle” by now with a contribution that would muddy the Other category further. Same with updated Beats headphones. The App Store is almost 9 years old. In that time it has generated about $100 billion in revenues, of which about $70 billion has been passed on to developers and $30 billion was kept by Apple. It’s very likely that running the App Store for 9 years did not cost $30 billion so, if it were an independent “business unit” it would probably have been and still be quite profitable. But Apple does not run “business units” with separate Profit and Loss statements. The App Store is a part of Services which is an amalgamation of non-hardware sources of revenues but that does not mean it’s a business. The purpose of Services isn’t to turn a profit or define its value through some metric of financial performance. The purpose of Services is to make the experience for the Apple user better. The combination of good experiences allows Apple to be perceived as a valuable brand and that allows it to obtain consistently above-average profitability through pricing power. I like to emphasize that the iPhone at over $600 in average price is more than twice the average price of all the other smartphones and captures over 90% of all available profits. This is something that remains after a decade and indeed the price is rising in the face of overall price erosion, all without a decrease in volumes. The sustainability of this exceptionalism is due to no one single thing. It’s due to the persistence across all the things Apple does: product, stores, software and services and many other details too numerous to count. The result is a large and expanding base of satisfied customers and a large and expanding base of partners both in hardware and software and services. The WWDC event this year showed how the ecosystem of Apple is booming with over 3 million new developers and Keynote screenfuls of partnerships. All this makes for a complex picture but it’s a real picture. 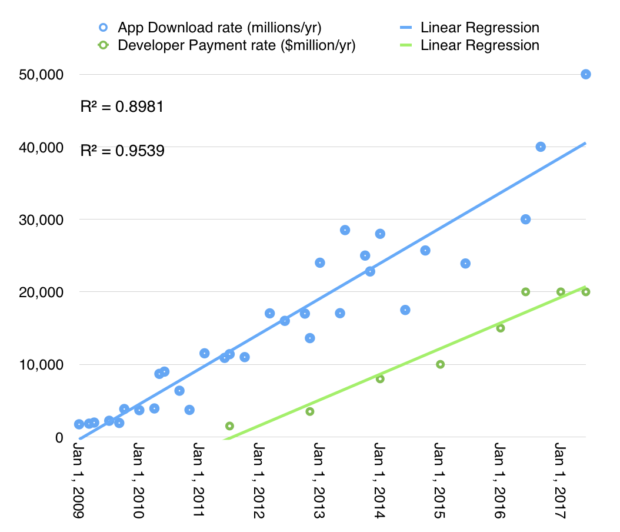 The revenue or payment rates can also be shown as accelerating though at a different rate. 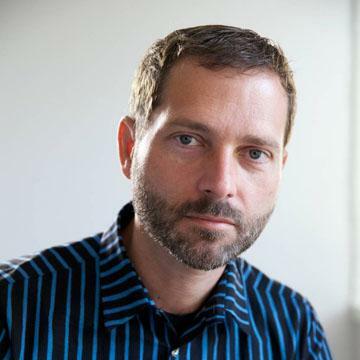 In both cases, the story of apps is not yet over, regardless of commentary to the contrary. Much of this growth comes from new markets like China and as India joins the iOS world, there is yet more opportunity emerging. 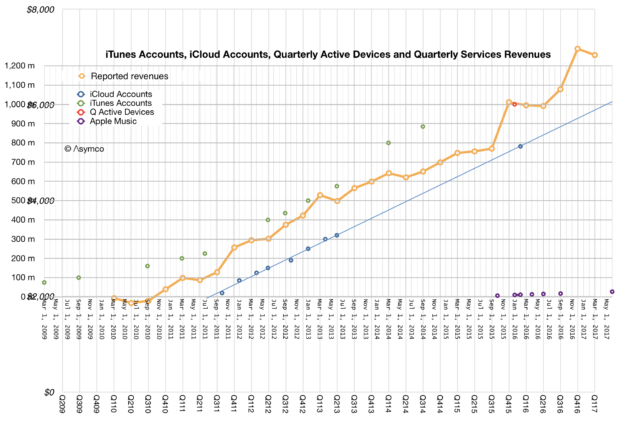 This enables part of the story of Services which can be tracked with several other metrics: reported revenues, iCloud accounts, active devices, and iTunes accounts are highly correlated. The patterns after a decade are remarkably consistent. One would have thought that with mobile saturation in advanced markets, the content story would be told through horizontal lines. What we still see is the same slopes we’ve seen since the earliest days. But the biggest story at WWDC was the re-design of the App Store as a curated content market. The changes are profound: discovery, curation and the surfacing of content have been revamped. It’s hard to predict the implications of this but one of the indications of direction was the separation of “Games” from “Apps”. This is a jarring idea since if all Apps are content, what makes Games different from other Apps? Is this a genre elevated to a new medium? I can’t yet get a sense of where this is heading, if anywhere, but the remarkable story of Apps is that it’s still an ongoing story. We may be on chapter 2 and we can’t predict how many chapters remain. Keep an eye on Apps and Services and developers. They are not lagging indicators of success for Apple. They are very much leading. 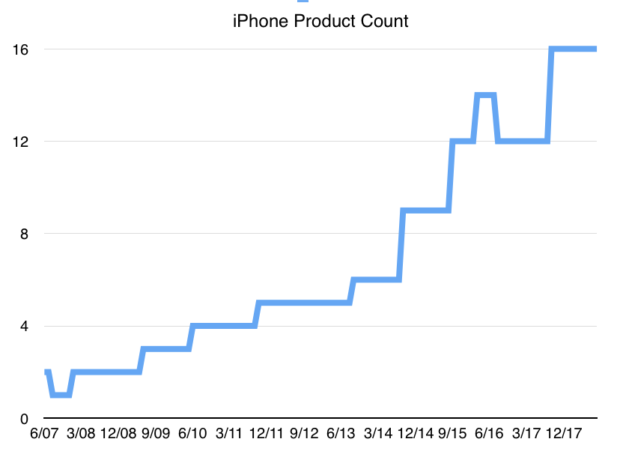 Predicting Apple’s yearly revenues has been fairly easy. 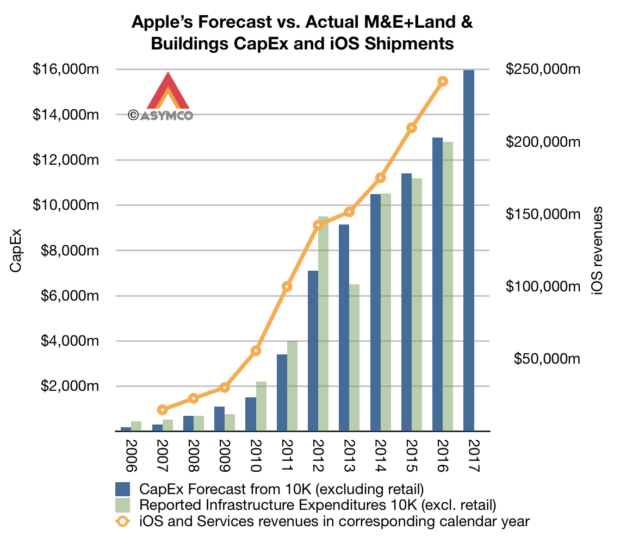 The following graph shows the relationship between budgeted spending on Machinery, Equipment, Internal-use software, Land & Buildings and the shipment of iOS device revenues. The company conveniently publishes a full-year forecast of these expenditures every fiscal year so by October we know roughly how sales will be during the following year. 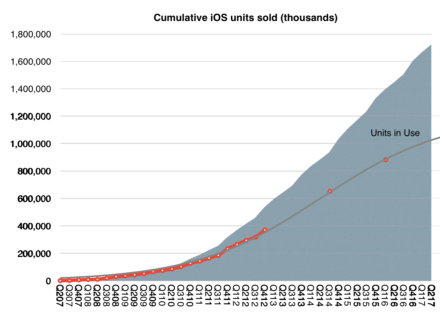 This pattern has held for 10 years so there is little uncertainty about the 11th year of iOS devices.